"Shikari" is a 2000 hindi film which has Govinda, Karisma Kapoor, Tabu and Kiran Kumar in lead roles. 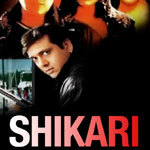 We have one song lyrics and one video song of Shikari. Aadesh Shrivastava has composed its music. Sonu Nigam has sung these songs while Sameer has penned its lyrics.